This week for Translation Tuesday, we're rereading Emily Paskevics' translation of a poem by Colombian poet Yorlady Ruíz López. The piece is from the collection, Poems for June, which won Colombia’s National Poetry Award at the XII Poetry Festival of Medellin in 2002. This week, I've chosen my favorite poem from last year's journal to share for Translation Tuesday. The piece is called »you’re my ivy-leaflet ……..« written by Friederike Mayröcker and translated by JD Larson. The text is available in the original German, as well as the English, below. As we prepare this year's journal for publication, we will be sharing work from last year's collection every single week on Translation Tuesday. 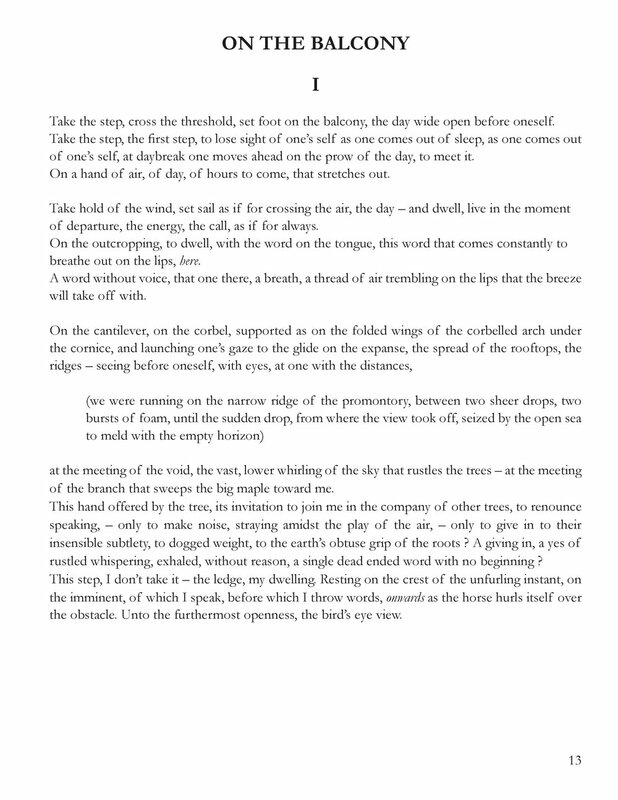 This week, I wanted to begin with one of my favorite poems in the journal – "Threaten," written by Laura Vasquez and translated into English by Evan Leed. You'll want to read this one aloud. Since we are a multilingual publication, we encourage you to read the original text in French too. We are proud to announce the forthcoming release of our first full-length collection of works in translation. The print journal will feature contemporary poetry and prose from all around the world, translated from the original language into English. 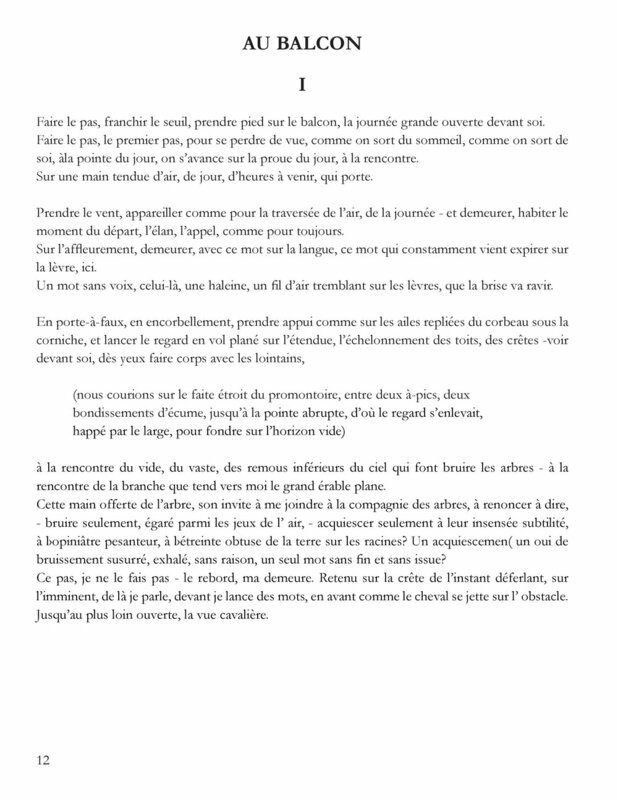 The booklet will contain side-by-side translations of each text, allowing readers to engage with both the original and translated versions simultaneously. For this anthology, we would like to invite translators to submit a selection of translated poetry or prose written by a non English-language contemporary author. By contemporary, we mean any piece that was written after 1980. By poetry/prose, we'll leave that up for you to decide. Read read our mission statement, peruse our recent publications and browse our blog to get an idea of what we're interested in publishing. You can submit a maximum of 3 poems for each author, but you can submit as many different authors as you want. Please limit prose submissions to no longer than 3,000 words. For more information, please visit our Call For Submissions. For those who were unable to make it to the event in Atlanta, we'd like to make the same opportunity available to you by providing the videos of each reader, as well as the pamphlet of side-by-side translations which appear and can be downloaded here. Our first video is from Chilean poet Carlos Soto-Román. If you didn't get a chance to pick up the zine at the festival, we've made it available online! You can read it below, or follow this link for a .PDF. Enjoy! If you walk toward the northwest corner of Plaza Miserere, in the center of Once, one of Buenos Aires' more neglected neighborhoods, you come across a smaller plaza, filled with photos, flowers, statues of the virgin mary, shoes hung from clotheslines, sad and angry letters, and a large plaque with the word "JUSTICE" etched across the top. This is the memorial to the 194 victims of the fire at the República Cromañón nightclub on December 30, 2004. It was one of the deadliest fires in world history and caused a backlash which exposed widespread government corruption and eventually led to the resignation of the city's mayor. Anybody who was young at the time seems to be directly connected to, or only a few steps removed from, at least one of the victims. The event, which could have been easily prevented, is still fresh in the minds of the city's inhabitants and if you go to the memorial the anger and sadness can be felt as if it happened yesterday. Marina Mariasch gave one of the best readings at last year's International Poetry Festival in Rosario, Argentina – or so I'm told. But I missed it because I was day-drunk and day-angry sitting on the steps outside, too tired to get up because a bunch of bros staying in my hostel kept me up all night, and I wanted everything in the world to go to hell. I regretted it immediately, since I liked Marina after meeting her the night before when she was happy about the free meals provided by the festival and trying to figure out a way to eat them without having to talk to anybody else. Two of my favorite things are free food and being an insane recluse, and my conclusions after leaving Rosario: never stay at a hostel again, check out Marina's poetry. OOMPH is growing, but we need your help. We're looking for translators and blog contributors with English and second language proficiency who have knowledge of poetry, translation and linguistics, to contribute works in translation, reviews and articles to our blog. We want interviews, spotlights highlighting journals and translated work, introductory surveys on regions and languages, original translations on contemporary or historically significant texts---we're open to pretty much anything. Feel free to pitch an idea for a monthly beat, or a single, isolated piece. Check out our blog for previously published pieces to get an idea of our current scope and framework. If you're interested in working with us, send a bio, a sample piece and proposal to editors@oomphpress.com no later than May 31st for review. As soon as I read the title of Ana Claudia Díaz's "The theorem of backs" I knew I was going to translate it. Poetry is such a vague and sprawling thing and I've always been a little insecure about whether I really "get", or even "like," most poems, but pieces that deal with the body always connect with me right away. When you talk about the body you go right to the root of experience. You start out with a solid and universal thing that leads to all the subjectivity of the world. Last month, I recommended The XUL Reader (Roof Books, 1997) as further reading for A Short Primer to Latin American Poetry in the Spanish Language. The reader is part of a larger project, spearheaded by Ernesto Livon-Grosman, called XULdigital, which aims to archive work from the historically significant Argentine journal XUL: Old and New Sign (1980-1997). Additionally, through an essay collection in Spanish and English called 5 + 5, it provides critical context to the project of the "Poetics of the Americas" in a continental sense, calling for both the reevaluation and redefining of "American literature" to encompass work from both continents. The entire project is digitized in an easily-digestible format, sponsored by the O'Neill Library at Boston College, providing access to a facsimile edition of the Reader, and a downloadable .pdf of the essay collection---an invaluable resource for those interested in contemporary experimental Argentine poetry, translation, and transnational poetics in general. I'm not entirely sure how, or when, I first stumbled across ANCIENTS. I think poet Brandon Shimoda originally told me about it; the journal features an old photo of his grandfather Midori Shimoda on the cover. Anyway, I got the last copy. It came in the mail one day, thick as a steak: a photocopied reproduction of a stack of 100 pieces of paper originally assembled and printed in 2013, featuring drawings, film stills, poems, travel notes, and translations by artists and writers from around the world, such as contemporary poets Corina Copp, Phil Cordelli, Leopoldine Core, Dot Devota, Sandra Doller, Brenda Iijima, Bhanu Kapil, Lucas de Lima, Lynn Xu, Karena Youtz, and a host of others.